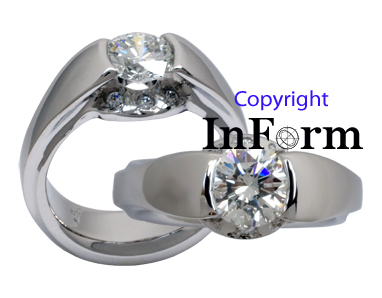 Seen below is a photograph showing two views of a platinum engagement ring I made in which I've set a round brilliant diamond weighing just over one carat. The people intended to be married within the Greek Orthodox tradition, which requires the inclusion of a 'crown' on the engagement ring. The ring of diamonds that can be seen both beneath and surrounding the diamond seemed to satisfy the requirements of the church. After making the ring and its being presented to the bride to be, a discussion regarding the appropriate wedding bands followed. Below and to the right you'll find an image and links that will take you to a location where you'll be able to view the resulting rings in combination with the engagement ring. ***Please note that a ring bearing at least reasonably similar character could also be made. I'm able to make rings of platinum, palladium, white gold as well as other colors of gold. While I don't make tension set rings, the channel set approach I use when setting a stone often shares many similarities. At the same time, it doesn't have the assorted problems associated with tension setting.